It's commonly brought up when advocating cloth, Dioxin, one of the gross chemicals found in disposable diapers. But what do we really know about it? 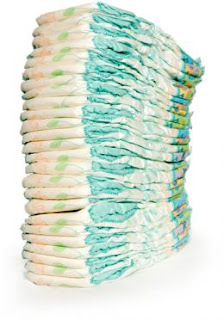 "Disposable diapers contain traces of Dioxin, an extremely toxic by-product of the paper-bleaching process. It is a carcinogenic chemical, listed by the EPA as the most toxic of all cancer-linked chemicals. It is banned in most countries, but not the U.S."
So I decided to head on over to the EPA website and see what I could find out. Using their search feature I was presented with numerous pages of information related to the toxicity of Dioxin. "Skin rashes, liver damage, weight loss, and a reduction in the effectiveness of the immune system have all been attributed to human exposure to dioxins." The EPA website categorizes their chemicals into subtopics and Dioxin IS in the carcinogen category. Carcinogens are described as "substances that may cause or aggravate cancer." Dioxins are dangerous because they can accumulate in the body over the course of ones lifetime. I know what you might be thinking, that exposure through contact with disposables is probably so small...It won't make a difference, right? Well take into consideration the fact that humans are exposed to Dioxins in a variety of ways, many times without our knowledge, and then purposefully add exposure via disposable diapers from birth up to 3yr the list! The exposure could be tremendous. Personally, and like most mothers I suspect, I always worried about my babies and toddlers health. We have no way of knowing in advance whether our children will have certain allergies, compromised or weakened immune systems, neurological problems or any other issues. The less we expose them to toxins, especially carcinogens like Dioxins, the better off they'll be. The Health Wyze Report recently published an article that helps describes some of the chemicals found in disposables, you can read this article here. Maybe you can't cloth diaper full time for whatever reason. Just keep in mind that even using cloth at home, whenever you can, is better than using disposables full time. You might also want to consider a cloth/disposable hyrbid diapering system which usually consist of a reusable cover and a biodegradable and/or flushable insert. *So what are your thoughts? Did you know about the presence of Dioxins in disposables or did you choose cloth for another reason? This is great. And I went over and read the Health Wyze report, too. thank you for sharing. Thanks so much for this information. When I originally researched cloth diapering, I was surprised to find out how many chemicals are in disposibles and that was a huge selling point for me. I never went back and really researched those chemicals though, so I appreicate your effort! Thanks for this post, I'm very happy we CD our DS. Just followed your blog, please follow me too :-) I have a review of CDs.